It seems like people are obsessed with bottled water. Suddenly, water from the sink just won’t do. Even though the bottled water is from some other tap (in New Jersey), we think that it is superior. Also, it is also convenient. Just grab and go when you head out the door. But, what about all the waste those bottles create? I think it’s safe to say that most people are not refilling those plastic water bottles. They are just throwing them in the garbage, or hopefully, in the recycling bin. I started to feel guilty whenever I bought one of those bottles. So, I started seeking out a permanent solution. I had reusable plastic water bottles in the past, but sometimes I could taste the plastic, and it wasn’t good for keeping drinks hot or cold. And it would sweat, which is really annoying. Then I discovered stainless steel insulated water bottles. They look good, come in a ton of colors, sizes and have different options for the mouth of the bottle. Best of all, since it is insulated, you can keep liquids cold or hot for several hours. Originally, I had a HydraSip,but I lost it earlier this year (I’m secretly still looking for it). I couldn’t believe how much I missed my bottle. Everywhere I went, I felt thirsty. When I tried to buy another one, I found that the company was out of business. At least, the website seemed a little sketchy, and was not working properly. 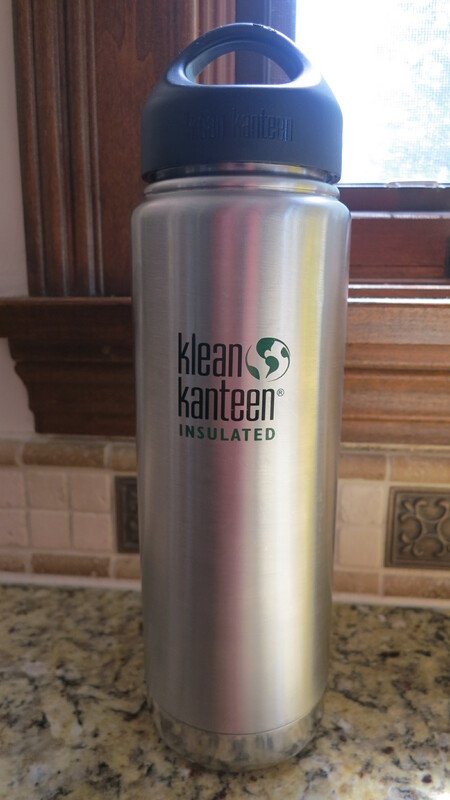 So, I did some research, and people had nice things to say about the Klean Kanteen. I ordered it from amazon, and while $25 might seem pricey fora water bottle, that’s really nothing compared to how much it gets used. Everywhere I go, it’s with me. I don’t leave the house without it. When I go to bed, it’s on my night stand. When I watch t.v., it’s holding my hand. I only use it for water, and it really helps me NOT drink other sugary/bad stuff throughout the day. I always put a few ice cubes in it, and since it’s insulated, it always stays cold. I usually keep the lid off, so the ice melts, but when I leave the lid on, the ice stays in there for longer than you would expect. The insulation also means that when you pick it up, your hand doesn’t freeze. It keeps a nice temperature outside no matter how hot or cold your drink is inside. No matter what you drink out of, consider using a vessel that is reusable. It’s so much better for our environment. This entry was posted in Favorite Things, Simplifying and tagged drinking, environment, klean kanteen, reusable water bottle, water. Bookmark the permalink.